For a very brief moment - the first 10 months of 1939 – the German Navy or Kriegsmarine stood on top of the feudal structure of Nazi Germany. Given the chance to execute Plan Z for large-scale naval construction, the Kriegsmarine’s commander, Admiral Erich Raeder, placed as many orders as Germany’s shipyards could accommodate. The biggest contracts were for six new battleships, all ordered in January 1939 with extraordinary budgetary authority granted to speed their construction. Two were laid down in July and August 1939, one at Blohm & Voss in Hamburg and the other at AG Weser in Bremen. A third ship was to be laid down in September 1939 at Wilhelmshaven Navy Yard and a fourth a month later at Deutsche Werke in Kiel. The fifth and sixth units were to be built by Blohm & Voss and AG Weser, but in newly-constructed building basins rather than on conventional slipways, since no more slipways capable of handling such large ships were available in a German shipyard and the basins could be dug much faster than new slipways could be raised. The six ships would be known as the H class. German practice did not assign a name to a ship until it was launched. Instead, a new ship would be designated as a replacement (Ersatz) for older units that had been lost or retired (Bismarck, for example, began construction as Ersatz Hannover) or by a letter if it represented an increase in fleet strength. In this case all six ships represented an increase in strength, and so they received the designations H, J, K, L, M and N when ordered. The Kriegsmarine’s design team, led by Rear Admiral Werner Fuchs, began work on the H class design in 1938. Outwardly the new ship greatly resembled Bismarck, the preceding battleship design, itself a lengthened version of the old Imperial Navy’s final dreadnought designs. The new battleship would be much larger than Bismarck: 62,000 tons’ displacement and 277 meters long, compared to 50,000 tons and 251 meters. Eight 16-inch (406mm) 52-caliber guns in four double turrets made up the main armament, scaled up from the eight 15-inch (380mm) main guns of Bismarck. The 406mm C34 naval gun fired a 1,030 kilogram armor-piercing projectile up to 36,800 meters and could penetrate 18.8 inches of armor at 20,000 yards. The 380mm C34 of Bismarck fired an 800 kilogram AP projectile up to 36,500 meters, penetrating 16.5 inches of armor at 20,000 yards. All of those figures reflect substantially inferior performance to the American 16-inch 50-caliber guns of the Iowa class and almost identical to that of the British 16-inch 45-caliber guns slated for the Lion class (with the German gun having better penetration). The new gun was much heavier than similar weapons of other nations, with a very thick barrel. Testing showed that it wore quickly and would have a relatively short barrel life, inspiring an unusual feature: the barrel liner could be removed and replaced at sea. Since none of the ships were completed, no crew was ever forced to test out this seemingly dubious proposition. The Kriegsmarine did not develop a dual-purpose secondary gun (one that could engage either surface targets or aircraft) until after Germany had stopped building new large warships. So like Bismarck, the new battleship would carry both a dozen 150mm (5.9-inch) guns to target enemy ships and sixteen 105mm (4.1-inch) guns to battle enemy planes. In another throwback to an earlier age, the H class had hull-mounted torpedo tubes, introducing a weak point into its protection for little gain in offensive firepower – the hull-mounted battleship torpedo had already been proven useless during the First World War. The designers apparently had been ordered to include the tubes for use against enemy merchant ships to conserve the big guns’ ammunition. The design placed the torpedo rooms exactly at the junction of the belt armor and forward armored bulkhead, introducing a potentially deadly flaw. The H class armor scheme reflected that of Bismarck, itself a reflection of Imperial practice rather than the most recent thinking on the subject. Like the all-or-nothing armor of American battleships, the H class would put its maximum armor thickness over vital spaces like machinery and magazines. Unlike American battleships, the belt would extend forward to cover the forecastle as well, a reflection of German thinking after the loss of the battle cruiser Lützow at Jutland in 1916 following damage to her bow and the progressive flooding that followed. The H class had a slightly thinner armor belt than that of Bismarck, 300mm compared to 320mm in the earlier design. But she had much thicker deck armor, with a second upper layer intended to set off plunging shells before they reached the main armor layer. Extra care was also taken to protect the fuel tanks; as her designers presciently noted, damage here could ultimately prove fatal on a long-distance raiding mission even if it did not immediately endanger the ship. Even before the ships were laid down, some of the engineers on Fuchs’ team raised objections to the relative lack of protection against mines offered by the ship’s bottom. They also wondered if the deck armor was sufficient against bombs. But Admiral Raeder had laid down a strict schedule for the ships’ completion and did not want to hear any objections. The design and construction work proceeded at full speed. While the H class design was highly conventional, even outdated, in many respects, it took a radical new approach to propulsion. The new ships would be powered solely by diesel engines, the largest marine diesels ever constructed up to that time. That would give the ships great range; diesel fuel would also be easier to obtain during wartime than fuel oil. It also meant that the ships would have extraordinarily heavy power plants, and would have to be constructed in an unusual stern-first manner. Given the hull form taken almost directly from that of the turbine-driven Bismarck and scaled up, this might have caused structural problems in the completed ships, though the “pocket battleships” performed very well with their marine diesels. The six ships were projected to cost 240 million Reichsmarks apiece (Bismarck had come in at a total of 197 million RM), with the full class costing about 1.5 billion RM. To put that in perspective, the most common German tank of World War II, the Panzerkampfwagen IV, cost 100,000 RM, making the H class program’s expenditure the equivalent of 15,000 medium tanks. Germany produced a total of 45,000 tanks between 1939 and 1945. When Germany went to war in September 1939, construction stopped on the two ships already laid down and contracts were suspended for the other four. Thanks to the rapid-building techniques employed by the shipyards and Raeder’s cutting of red tape (or “ego-driven abandonment of common-sense cost and quality controls,” depending on one’s point of view), the two uncompleted battleships were much more advanced than one would assume for a project only a few weeks along. Some re-design proposals would be made, but the naval architects quietly pressed for the hulls with their inadequately armored bottoms to be scrapped instead. Both were broken up in 1940. By any rational measure, the Nazis’ pursuit of the H class program – like most of their thinking - was simply insane. Nazi Germany was a much poorer country than the old Empire and could not afford a prestige project of this magnitude and still equip her land and air forces. Raeder for his part knew that he had only a narrow window of political influence during which he could get the big ships built, and he pressed Fuchs’ design team to cut corners and rush their work, resulting in a tremendously flawed ship. And because Raeder’s insecure place in the Nazi feudal hierarchy did not allow the time to complete of the first ship as an example for study before beginning the others, the mistakes would be repeated six times rather than just once. 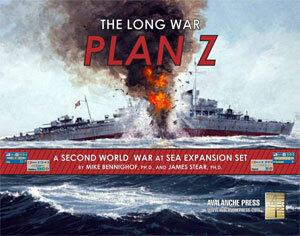 All six ships appear in our massive Second World War at Sea: Plan Z expansion set, flaws and all. They can dish out a great deal of punishment, but they are far from invulnerable themselves. Mike Bennighof is president of Avalanche Press and holds a doctorate in history from Emory University. A Fulbright Scholar and award-winning journalist, he has published over 100 books, games and articles on historical subjects. He lives in Birmingham, Alabama with his wife, three children and his dog, Leopold. Leopold is well-designed.